An enamel stick pin of "Pincher" from the painting by Abraham Cooper William Essex (English, 1784-1869). 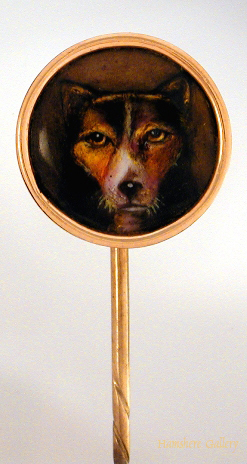 An enamel stick pin of "Pincher" from the painting by Abraham Cooper (1787-1868) of his trusted dog, Work by William Essex (1784-1869) English, circa 1860. "The Royal Collection" today holds a substantial number of enamels by William Essex.